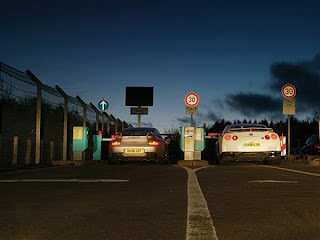 Home > nurburgring > Automobile Magazine Nissan GT-R vs Porsche GT2 at the Ring. Automobile Magazine Nissan GT-R vs Porsche GT2 at the Ring. This Automobile article is a reprint of the article that was featured in Drivers Republic back in November. A few months later and still the same results. For me, the result was a forgone conclusion. The moment you feel how physically fast the GT2 is, you can't believe that the GT-R could possibly beat it. Of course, the GT-R doesn't acknowledge the usual formalities of science and somehow got itself to within seven seconds of the Porsche's time. The final scores are: Porsche, 7 minutes, 49 seconds; Nissan, 7 minutes, 56 seconds. There is no doubt in my mind that the Porsche will go substantially faster, given a drier track and some time to build confidence on the really hairy parts of the circuit.